Technically this was my last #summerofbasics project. I liked the idea of finally tackling something that I've admired for a while but that seemed too challenging or time consuming to make. It was that last push needed to make me realize how many wonderful, interesting, challenging, and beautiful patterns were in my mental queue. This particular pattern is also from a Japanese knitting book. 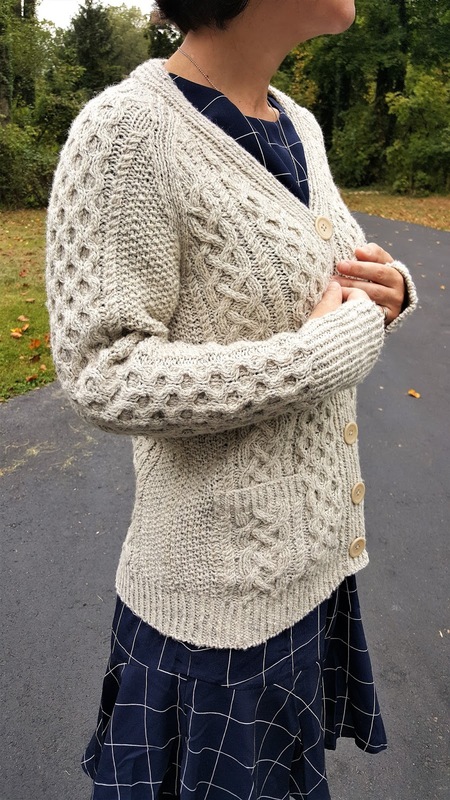 It was published in Keito Dama # 156, Winter 2012, and in this book - Best Selection Of Aran Knits - that I got for our anniversary from my husband (he bought it on Ebay after I found and sent him links to the books I wanted). Since I get a lot of questions about the sources of Japanese knitting patterns I decided to write it all down here for those who want to find same books or magazines and make same patterns. If you are looking for a knitting book that is not sold in American bookstors or on websites with yarn and knitting supplies you'll find them most likely on Ebay, Etsy, and Yesasia. Sometimes on Etsy you can even find an electronic version of a book/magazine and get it almost instantly. In all other cases you'll have to wait for up to 2 weeks (that is how long I usually wait for my orders from Yeasia). Once I ordered a Japanese knitting magazine from Amazon and had to wait for 2 months. I was really worried but eventually got it. So plan accordingly. Buying rare knitting books seems a good investment to me, since there are few things in fashion that haven't been discovered and used before. Everything is coming back eventually in this or that form, you just have to pay attention. Japanese patterns are feminine and classic, with good math and clear charts. In my opinion they are timeless. This pattern looked very appealing on its photographs in man's or woman's version. It has EVERYTHING the real classic cardigan needs if you ask me: intricate but familiar cables, pockets, long ribbed sleeve cuffs with thumb openings (LOOOOVE this because my hands are always cold), and a hood. I had this yarn in my stash - Queensland Collection Kathmandu dk - for what seemed like ages. It was silky, tweedy, oatmeal colored with some grey and black speckles, and probably predestined to become this cardigan, which was why it lingered for so long in my basement. After some deliberations I decided to go without a hood because I couldn't imagine a situation where I would actually wear it. After some more deliberations the neckline was also changed in my mind. V-necks look better on me than crew-necks, I really don't need a cardigan that would be too warm - just warm enough. It is not too hard to change this part of a pattern, especially when the back is already finished and you know already how many rows it takes. Just calculate the amount of stitches to decrease on the neck side, and distribute the needed decreases evenly over the rows after the armholes (this was where I started decreasing, but you can start earlier or later, your choice). Then I made a swatch and discovered that the woman's size would be too tight for me. I am a tight knitter, and for this cardigan I really wanted some positive ease. That is why I had to work with the pattern for a man's cardigan, which is no big deal because they are practically the same. After the back was finished I decided to add 3 stitches to both fronts: one selvage stitch, one purl stitch, and one knit through the back loop stitch. That is why, when all was finished and button bands were sewn to the front parts, the seems are not that visible. The button bands ribbing continues the K 1 x P 1 on the fronts. Also I picked 9 sts for the button bands (I don't remember the exact number, but it was less in the original pattern) and worked them the same way I did for Helga Isager's Ebony. I think it looks more polished and professional when done this way and I am going to use this method again and again. 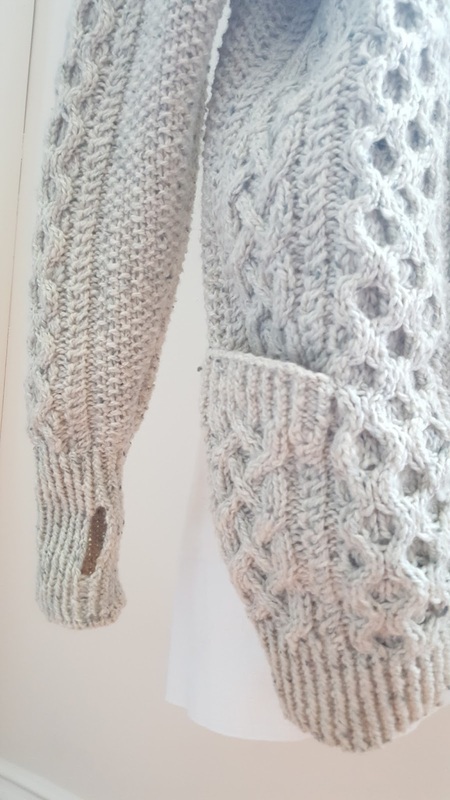 All parts of this cardigan have a provisional cast-on, which means that at the end, after having assembled the whole thing, you pick up stitches and do the ribbing. Even though, it slows down the finishing, I liked working this way because I could finish everything with Kitchener cast off - again, looks better and more professional to me, plus it is very stretchy. You don't want the ribbing on your cardigan to be too tight, especially on sleeves. 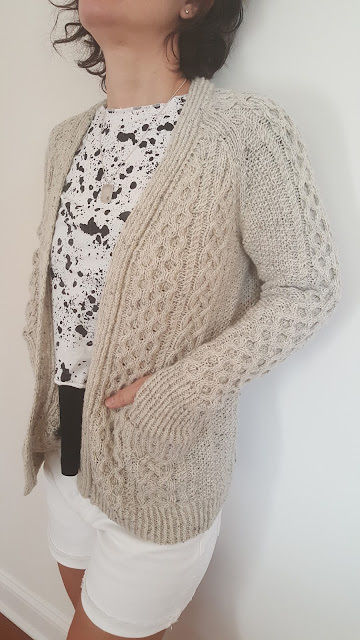 I used my old store bought cardigan as a sample for this garment, checking constantly with its measurements. That was another reason why doing the ribbing at the end was beneficial - I could make it as long or as short as I wanted. All in all I am very happy with the end result. I dreamed about this particular pattern for a long time, and finally my dream came true. That is why I called it Dream Cardigan. As I said the finishing took a while, especially since I couldn't wait and started finishing it with jet lag after we just came from England. Needless to say that I had to unravel everything and start all over a couple of days later. Yet, I prevailed and finished it before we left for Florida. Now, that was a read of substance. Thanks for all your observations on this cardigan. Is the buttonband of 9 stitches narrower than what the pattern called for and is this why you say it looks more professional? Well, actually my buttonband is bigger than in the original pattern because I wanted to have more positive ease overall, was afraid that the cardigan would be too tight. And I think it looks more professional because I used the same method that I discovered while making Ebony, as I have already mentioned. I don't have Helga Isager's book with me now (it is in Florida and I am in Pennsylvania). As far as I remember, you slip the second stitch as for a purl on the front row and purl it on the back row. For the opposite part of the buttonband you do the same for the stitch before last (better double check in the book, my memory is not as it used to be). This way the buttonband's edge is less stretchy and "wobbly". Lovely styling of your oatmeal aran!